When we say competition in the car industry is worryingly bloodthirsty, we aren’t auditioning for Drama 101; we mean it. Every segment has multiple contenders, each vying to be number one in the class. New iterations see the cars getting better and better by including more standard features, delivering top-notch safety specs and providing the most capable drives ever. But no contest is quite as cutthroat as the battle royal going on in the full-size truck segment. If the newly redesigned Dodge Ram and Ford F-150 didn’t exist and the Chevrolet Silverado wasn’t worthy of mention, the 2009 Nissan Titan would have a fighting chance for victory. Alas, while it does everything well, it has neither the clout of the champions nor an American badge. And there are others standing in its way, too; a fellow Japanese product, the Toyota Tundra, has gained serious headway against the U.S. marques. While all those pickups don’t leave the Titan with much breathing room, it should be noted that the truck, despite its small following, is incredibly good. It possesses a forgiving suspension, worthy brakes and a powerful engine, none of which will leave a driver wanting. There’s a bevy of standard features and good looks apparently run in the family. The truck will never post numbers like the F-series but the Titan has enough of the right stuff to continue putting a dent in American truck sales. Its size may be daunting, but the Titan is a fully drivable truck – not just efficient at hauling parts, it also masters the quick errand. We’re partial to the exterior styling, which looks cooler and more aggressive than some of the more boxy, traditional designs. We now think every reverse-opening rear door should swing out almost 180 degrees. Houston, we have a problem: At $26,150, the Titan hits the most expensive starting price of the lot. Regardless of the fact that an equivalent setup on other trucks is usually more expensive, the extra dollar signs won’t initially help woo buyers over to Nissan’s lots. Optional extended side mirrors seem to actually decrease visibility – a difficult feat with C-pillars the size of a Mini Cooper body panel – and they tend to catch the headlamp glare of every car on the road. 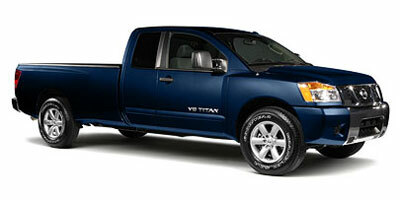 Shockingly, considering its mean-street looks, the Titan has a more refined drive than one would expect. 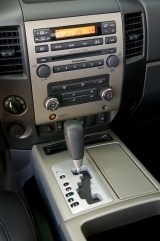 Transitions between gears flow smoothly, almost too smoothly for what we consider normal in a pickup. Subtle sophistication spreads throughout other aspects of the drive too. Its suspension is forgiving, leaving the riders unpunished as it travels over multiple forms of terrain. Steering is direct and doesn’t feel disconnected like others on the market. Under heavy loads, the V-8 still feels capable enough to safely pull the truck along. But Nissan has erred on the side of caution with its traction control, rendering it so severe that it scolds you almost before you’ve done anything wrong. We’ve mentioned already that visibility is an issue, but it’s the only problem to be found in the driver’s seat. Wind noise is muffled and seating is comfortable. Though, for the rear seats to effectively fold up, they are less padded than we’d like. The 5.6-liter displacement provides the V-8 engine with ample power to compete against the best of the best. It’s the only engine Nissan offers with the Titan, and it delivers a healthy 317 horsepower and 385 lb-ft of torque. The truck features standard rear-wheel drive with four-wheel drive available on all trims but standard on the PRO-4X. Skid plates can be had on certain trims as well. 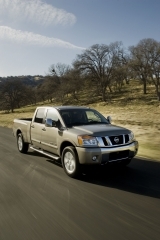 Depending on what you plan to do with the Titan, Nissan has provided options to fit multiple lifestyles. For added comfort, power folding outside mirrors with integrated turn signals, heated seats and a moonroof are all on offer. In more utilitarian fashion, the Titan can come equipped with a tow package, tie-down cleats, a heavy-duty battery and lower final gear ratio. Towing maxes vary with regard to the trim, but you’re looking at numbers anywhere from 6,500 to 9,500 pounds. At the top end of the Titan lineup, the LE comes fully loaded with a rear parking system, 350-watt Rockford Fosgate-powered audio system, Bluetooth and satellite radio capability, leather power heated front seats and power adjustable pedals. A navigation system with seven-inch screen can also be had for $1,800. We’ll leave it to you to determine whether it’s worth it. You can almost feel the air’s ebb and flow as environmentalists wag their fingers in the Titan’s direction. At a segment standard 12 mpg city and 17 mpg highway, the mpgs aren’t pretty. Though the truck does receive a LEV rating from the EPA, which is good, not great. What is of significance is the no-cost flex fuel option, allowing the truck to run on E85 Ethanol for reduced emissions. However big the Titan seems from the outside – the name didn’t exactly come out of thin air – translates unconditionally on the inside. Spacious and accommodating, the interior seats five or six with the optional front bench. With the rear seats folded, the flat floor (something missing on the Dodge Ram) provides a good amount of interior storage room. Compartments fill the cabin too, leaving no space unused. In the refresh, Nissan went out there and just did it – further refining one of the boldest and baddest looking trucks on the market. It is just as a truck should appear, ready to mow down some mailboxes and frighten small children. Yet, a hidden strut helps the tailgate drop down easily and rear doors swing out almost 180 degrees for ease of use. Without a B-pillar on the King Cab, loading is almost embarrassingly simple. An optional lockbox, located behind the rear wheel well, is perfectly suited for muddy boots – but it’s no RamBox. The base model King Cab XE begins at $26,150, but pricing can reach to $36,050 for the Crew Cab LE trim. Add a few more options and the Titan can potentially see the wrong side of 40 grand. For roughly equal power out of the Ford F-150, the price (which does include many more standard features) hits $32,665. A similarly speced Toyota Tundra compared to the base Titan comes in at $25,050 and the Dodge Ram 1500 SLT Quad Cab 4x2 is priced at $30,375. Also arriving around the same price point are the GMC Sierra and Chevrolet Silverado. It’s a dog-eat-dog world out there, and full-size trucks can get swallowed whole if they aren’t marketed well and can’t meet standards set by the top competitors. Nissan checks all the right boxes with its 2009 Titan and, while we don’t think the F-150 will be knocked off its perch anytime soon, it can definitely give the big guns a run for their money.